Whichever route you choose, the bill can add up quickly, as audiobooks are generally more expensive than their print equivalents. Even if you get a subscription with Audible.com, you’re limited to a couple of books a month, and if you listen a lot, this might not be sufficient. Browsing the collection on Audiobooks.com. 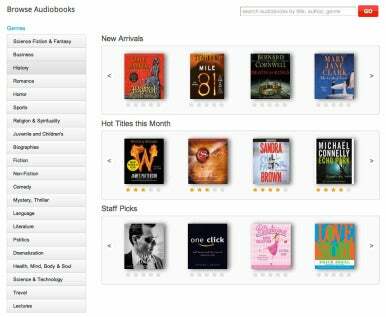 A new service called Audiobooks.com (nice work snagging that domain, by the way) aims to help the heavy-listening crowd—think of it sort of as Netflix for audiobooks. For $25 a month, you get unlimited access to its selection of audiobooks, and you listen to books by streaming them, rather than by downloading them and adding them to your iTunes library. In addition, since it is a Web-based service, you can listen on your computer, your iPhone, your iPad, or any other device that can access the Web. The window you use to play a book is small, and has all the necessary controls. 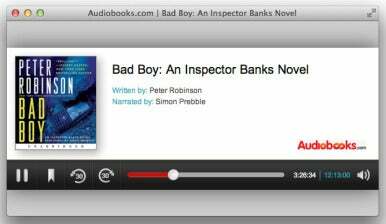 The Audiobooks.com website is easy to navigate, and all you need to do to start listening to a book is click a button. A small window opens in your browser—or, if you’re on a mobile device, such as an iPhone, a new tab or window—and you can start listening. You can pause, play, adjust the volume, and add a bookmark. If you listen to part of a book on your Mac, then want to switch to your iPhone, say, not to worry: the website stores your location, so you can pick up where you left off. I found this feature generally accurate, though sometimes it was few seconds off from the point I stopped. In addition, when you go to the site, you immediately see the latest book you’ve been listening to, along with any other books that you haven’t finished. If you want to remove one from that list, just click on the x in the top-right corner of the book’s graphic. Unfortunately, there are no chapter markers, so you can’t tell how much time is left in a chapter, or skip ahead to the beginning of the next chapter (which is especially useful in collections of essays or short stories, for example). 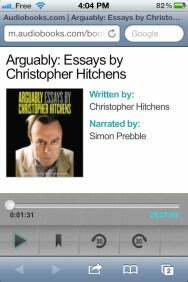 While listening to audiobooks works well on iOS devices, a dedicated iOS app would be a plus. (The company is planning to release native iOS and Android apps later this year.) It’s also important to note that because listening is an streaming affair, these books use up bandwidth, so if you have a cap on your data plan—if you’re not listening via Wi-Fi—you need to be careful. The website says you should have “at least 150 MB of storage available,” for caching books, but doesn’t say how much size any given book takes up. (With its 64-kbps data rate, that’s about how much data a 5-hour book would use.) Also, if you don’t have network access, then you can’t listen; so if you’re on the road, and go through an area of poor coverage, you may lose access temporarily (as you will as well on a plane or on the subway, or any other place when you don’t get a data signal and Wi-Fi isn’t an option). When the native apps are available, the company promises some kind of offline mode. Audio quality was fine, and generally sounded like audiobooks from other sources. There’s much to be said for this type of service, where for a fixed monthly fee, you get all you can listen to. The cost is fair, given the price of audiobooks, but whether it’s worth it for you depends on how many books you find to listen to. The site has just launched, so it’s likely that the selection will improve. In any case, there’s no commitment, so even if you only find a few months worth of books, you can cancel your subscription at any time. And if you’re on the fence, there’s a free seven-day trial you can enjoy as well. So, the idea is good, it works well, and the price is fair. All Audiobooks.com needs now is a lot more books.